Viva La Italy, even alongside the classic American scenic beauty of Santa Cruz. There is a thriving Santa Cruz Italian restaurant scene tucked away into this beachside village, and any of the options are a delicious and delectable delight. Your choice of Italian Santa Cruz restaurants depends on your mood and whether or not you are yearning for something upscale and fancy, or down-to-earth and casual. Ristorante Avanti takes Northern Italian cuisine and gives it a decidedly Californian spin. 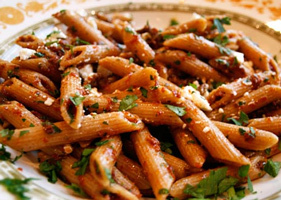 The food here ranges from beef-inspired dishes to authentic pasta and other Italian cuisine. You can enjoy some of the most tender-tasting chicken in town at this Italian restaurant and there is an extensive wine bar for those looking for something to complement their Italian meal. La Posta offers homemade sausage dishes and handmade pasta, which can be hard to match in terms of delicious Italian cuisine. In fact, the fresher the ingredients, the more amazing they are bound to taste, which is why this is one of the most well-known restaurants in town. You can enjoy dishes here that can’t be found at the local chain restaurants, so this is definitely worth checking out any time you are visiting the Santa Cruz area. Meanwhile, those looking to chow down on Italian food in a simpler environment may enjoy stopping by Lillian’s Italian Kitchen. Yes, there are only about 15 tables in the entire restaurant; however, this adds a cozy ambiance to the restaurant to match the delightful offering of cuisine available. The same can be said for Café Mare, which is equally cozy and a great option for those looking for that Italian comfort food that is both filling and enjoyable to your taste buds.